In September 2010, we worked with Lama Tenzin, a senior chöpön of Namkha Drimed Rinpoche, who is well-versed in Gesar practice and lore. During one of our meetings, Lama Tenzin, after consulting with Namkha Drimed Rinpoche, explained the phrase nang si shir sheng (“the phenomenal world arising as the ground”), a profound ati term appearing in one of the Gesar protector chants we were translating. 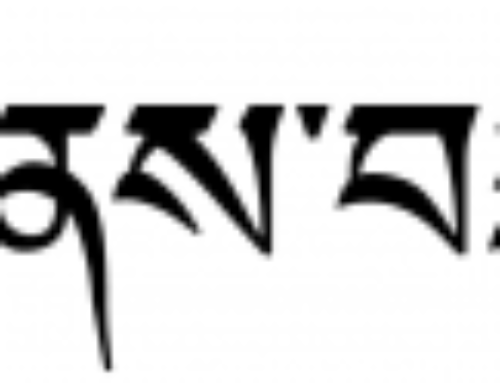 We have discussednang si previously (see below in another “Right Word”); here we focus on shir sheng.During the meeting, Jessie Litven translated for Lama Tenzin (LT). Also present were Larry Mermelstein, Mark Nowakowski (MN), Scott Wellenbach, Tingdzin Ötro, Patricia Kirigin, and Walker Blaine. Lama Tenzin: The phrase nang si shir sheng is a very high dzokchen (San. ati) term with a really vast meaning. In the term nang si (“phenomenal world”), the nang refers to the object, and the si refers to the mind. Here, “object” means various external objects, such as the objects of sight, sound, and smell. The term shi (“ground”) in shir sheng refers to primordial dharmata. It is discussed in theTreasury of Dharmadhatu (Tib. Chöying Dzö, one of the seven treasuries of Longchen Rabjam, 1308-1364), which is an elaborate explanation of the ati practice of trekchö (“cutting through”). When ordinary people perceive an object, their minds turn outward and get lost in external appearances. But for a skilled ati practitioner, when a thought arises, instead of mind turning outward toward an external object, the outer object kind of comes back in, like a reflection in a mirror. In this case, the mind remains within rikpa (“awareness”) and does not waver from that. In other words, things arise for both ordinary people and ati practitioners. They both experience sounds, smells, tastes, and so on. But the mind of an ordinary person goes out and gets lost in the outer objects. But for practitioners, when outer objects appear to them, their rikpa does not become disturbed or confused. Like a mirror, rikpa is able to reflect any object, but it is not stained or affected by the appearances. Therefore, whatever appears is pure. The Ultimate Essence of the Guru (Tib. Lama Yangtik, a commentary on ati tantra by Longchen Rabjam) explains that sheng is the honorific word for “to get up” or “to arise.” Therefore, the phrase nang si shir sheng is saying that the nang si, or phenomenal world, is able to arise or appear to the shi, or ground, which is rikpa. It is like what is said in thePrajnaparamita Sutra: form is emptiness, emptiness is form. We talk about form as appearance-emptiness, sound as sound-emptiness, and so on. In other words, while they appear, they are empty; while they are empty, they still appear. Sight, sound, smell, taste, touch, and so on appear, although they are empty, and they are empty while still appearing. All of these arise in rikpa, but it is without any grasping. MN: In our translation, we say “the phenomenal world arising as the primordial ground.” But I’m wondering if “arising in” might be better. LT: “As” (Tib. final r or ru) seems good. But if you say “in,” it would not be wrong. MN: But then they sound separable. LT: Grammar texts say that if you use ru (“as”), then there is a kind of inseparability. That is probably what is happening here. LT: As for the offering, a practitioner whose awareness is completely without grasping or fixation can still see visible things, still hear sounds, and still smell smells. All of these things continue to arise. But if your awareness is not getting lost in outside objects and you are able to rest within rikpa, they are empty as they arise. There is an awareness, and yet it is empty. Everything you perceive while in this awareness free from grasping and fixation is what you are offering. Mahamudra speaks of the yogic level of simplicity, or freedom from elaborations (Tib. trö-tral; the second yoga of mahamudra). Here, we are talking about a practitioner who has reached that level. In general, there are three levels: understanding, experience, and realization. Understanding means looking at the words and gaining some intellectual understanding. Experience is having some taste of what is happening. It is variable personal experience: sometimes it is up and sometimes it is down. Realization comes when you have truly received the blessings of the guru. Ati is talking about a practitioner at that level.